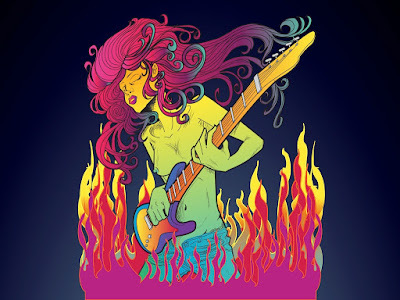 Xanaland Main Blog Site: Highway 99 Blues Club Presents Javelin Record Release Party! April 28th~ With Ben Smith & Friends~ An All-Star Night of Music! With Johndus Beckman of Ten Miles Wide, Jeff Angell of Staticland, Kathy Moore, Jeff Rouse, Ryan Waters, Brooke Lizotte & Shawn Smith Featuring Andy Stoller & Special Guests~ Never Before on One Stage Together! 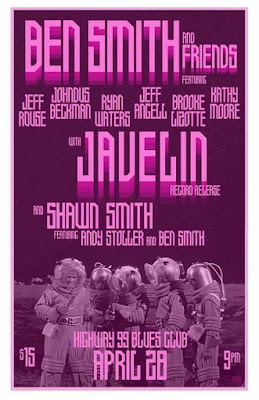 Highway 99 Blues Club Presents Javelin Record Release Party! 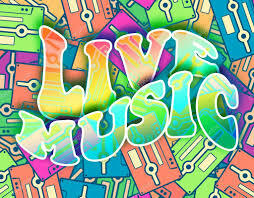 April 28th~ With Ben Smith & Friends~ An All-Star Night of Music! With Johndus Beckman of Ten Miles Wide, Jeff Angell of Staticland, Kathy Moore, Jeff Rouse, Ryan Waters, Brooke Lizotte & Shawn Smith Featuring Andy Stoller & Special Guests~ Never Before on One Stage Together! Much love, planning and thought went into bringing some of the best local musicians to the same stage! I've written so much about most of these musicians I feel a little silly going on and on about them, but here I go! Johndus Beckman will be soon on the road with his band Ten Miles Wide. He plays lots of solo shows but has never shared the stage with Kathy Moore or legends like Shawn Smith. His solo music is captivating and he cannot be placed in any single genre of music. Here is a video I shot of him recently at Hwy. 99 Blues Club playing a new song he co-wrote with Intisaar Jubran. Ryan Waters has played with greats like Prince, and the last time I saw him was shredding next to Mike McCready at the annual Flight to Mars show at The Showbox. He's a joy to watch and versatile as they come. ( more on him below and for a full bio, read more on him here! Don't get me started on Kathy Moore. 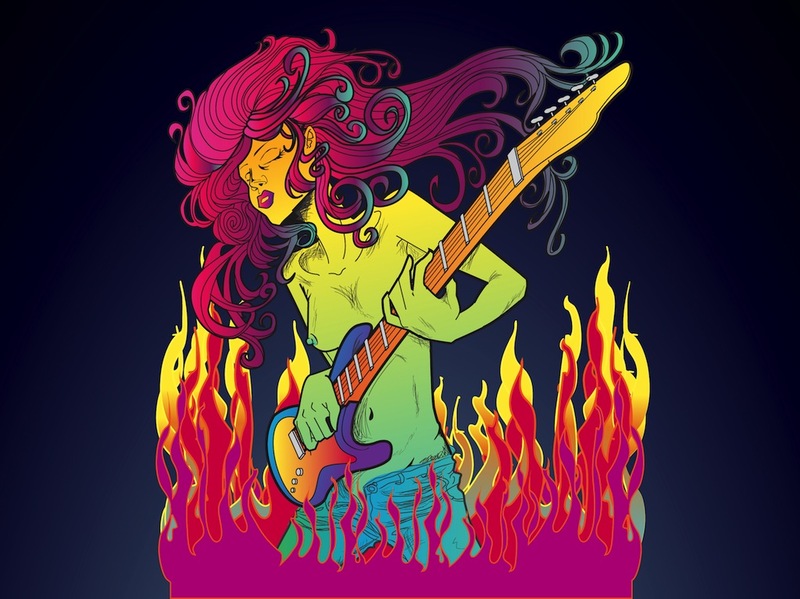 She plays in so many bands and projects no one can possibly keep up with them all. Her current primary band The Guessing Game features Jeff Rouse JAVELIN is suppose to be amazing! Read more about them on Hwy. 99's website here! Here's Kathy Moore playing with friend R.L. Heyer at The Royal Room a few years ago. Ben Smith is the drummer for the legendary rock band HEART and is one of the worlds most respected and talented rock musicians. In 2016 he formed a new band Roadcase Royale which includes Chris Joyner on keys, Dan Rothchild on bass and Ryan Waters on guitar, vocalist Liv Warfield of Prince’s New Power Generation, and of course, Nancy Wilson herself. Ben has been performing, songwriting, recording and producing for over thirty years. Most recdently Roadcase Royale performed with Jerry Cantrell and Mike Inez for “Rock Against MS” at the Los Angeles Theater. Ben Smith and Friends originated here at Highway 99 Blues Club last year. This has been an outlet for Ben to gather a collective of local and touring musicians, in the intimacy of a small club environment. Each Ben Smith and Friends show is unique from the others. His shows have traveled the spectrum of Jazz, Blues, Jam, Rock n Roll and beyond. Ben changes it up every time and it is always sure to impress the musical ear. 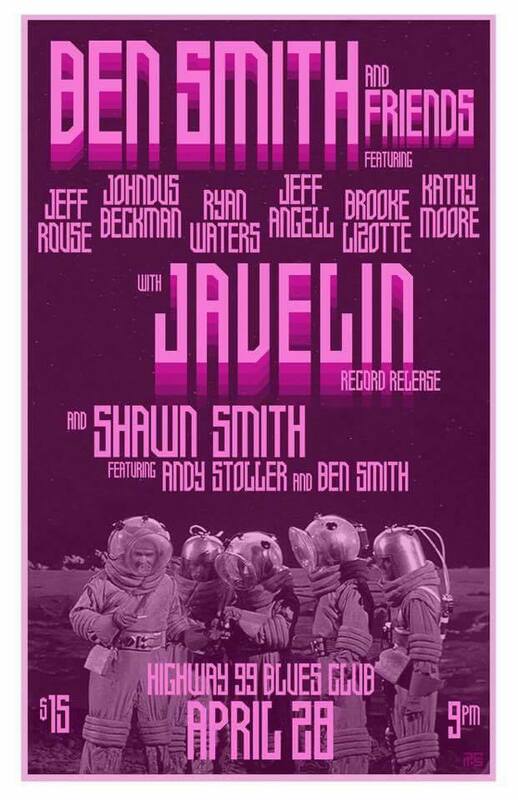 This time around Ben has put together an amazing line up of some of Seattle’s top rock musicians in support of Javelin’s debut album release party. From his immediate wheelhouse, Ben has invited Grammy Award recipient Bassist Andy Stoller, (Ann Wilson, Tracy Chapman, Star Anna), Brooke Lizotte, (Pianist, singer/songwriter, producer) and guitarist Ryan Waters, (long-time member of Sade, Song-writer, composer, producer). This is a night no one will ever forget! Get your tickets now! Tickets and more on this show~Click Here!